» Coffee and fillings: How about a sign? Coffee and fillings: How about a sign? The future Waverly Starbucks the way it looked on Sunday. 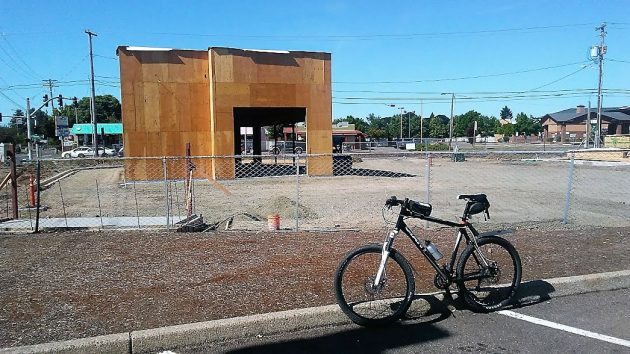 Every few days, it seems, somebody asks on Facebook or elsewhere what’s being built at Waverly Drive and Santiam Highway in southeast Albany. Nobody would have to ask if developers just put up a big sign announcing what they’re building on the corner of two busy streets. The answer, of course, is a new Starbucks coffee shop with a drive-up lane along with a Gentle Dental clinic. The Starbucks in the Fred Meyer building across Waverly will move into this location instead. The names of the businesses in the new buildings have been a matter of public record since last Sept. 6. That’s when the Albany Planning Division issued a public notice of a pending application for a site-plan review at 2708 Santiam Highway S.E. After receiving no written comments, planner Shawna Adams followed up with an Oct. 27 staff report outlining how the project met all the various requirements of the city’s development code. There had been some concern whether cars waiting for their turn at the Starbucks drive-up window would obstruct traffic on Santiam. But the plans were changed to allow for 11 cars to queue up there, and that was considered sufficient for the expected number of customers. The plans called for building a 2,100-square-foot Starbucks and remodeling an existing building into a 3,400-square-foot dental office. “Remodel” sounds odd when you look at the site now. Only one wall of the old building is left standing. There’s nothing else left to remodel. 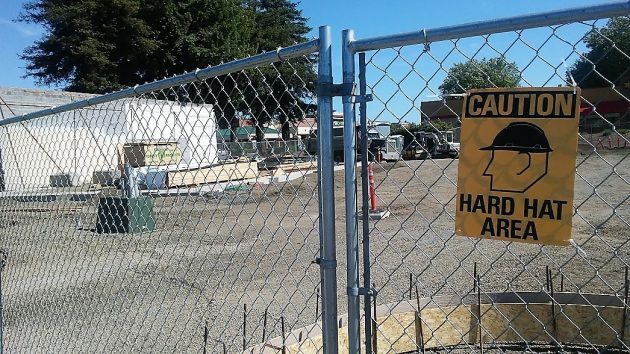 This story has been edited to fix a typo in Shawna Adams’ name and add the fact that the Starbucks at Fred Meyer will move to the new site at Waverly and Santiam. Just a wall is left where a dental office will be. On the fence, a sign announcing the project would have been helpful to curious passersby. 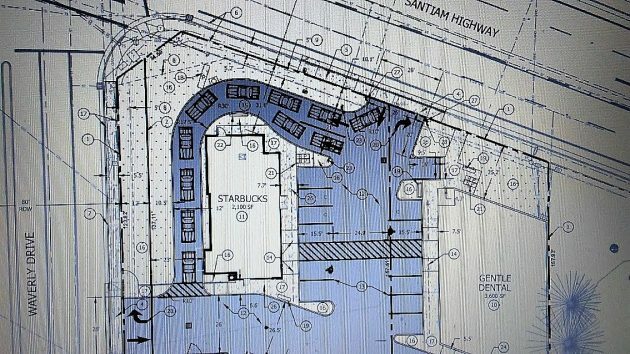 This drawing, part of the city staff report, shows cars lined up in the Starbucks drive-up lane. We don’t need another starbucks, and that is the worst spot to have it along with a dental office. This is a terrible location for any type of drive thru business. I just don’t see how 11 cars will fit. We’ll see. The city makes money when businesses pay for plans, permits inspections. Logic does not bring in any money. When it is built avoid the area because short fuse pile ups from impatient people is a sure bet. Bull. The City does not “make” money, the city charges to cover costs.The development is driven by the private sector: people who own property and people who want to do things with it. Go back to school Leroy, and learn how government actually works. yeah starbucks is awful coffee. Albany needs a nice food store like a natural grocers, trader joes, market of choice, instead of the same old fast food garbage that is cluttering up the city. i agree we don’t need another starbucks. how about a sonic in albany would b nice. I totally agree, awful coffee, and poor use of land. Wish there were announcements in the paper when there are plans being proposed so people could voice their opinion. All I can see is a traffic back up nightmare in an already busy intersection. I can’t believe the city was ok,with this plan. The Dutch Bros up the street causes enough problems! Yeah I don’t get how the city of Albany can allow traffic problem businesses like Dutch Bros. on Santiam, and now a Starbucks at Waverly and Santiam, while at the same time creating bulb outs and roundabouts to “improve” traffic and pedestrian safety. Waverly and Santiam is a MAJOR intersection. This will only make it many times worse. Much better location. It’s on the way to I-5, and you don’t have to enter the hellscape that is Fred Meyer’s parking lot. Wish it was Universal Coffee instead, but sometimes you just need caffeine. Also, the Fred Meyer Starbuck’s no longer has a newspaper rack. They keep newspapers behind the counter, and if you ask for one they will charge you before you even decide you want to buy it. That isn’t the way Starbuck’s operates at other Starbuck’s stores. I hope this new one has a newspaper stand. I live in the Waverly Square Apts just down the street from the intersection. I here police and ambulance sirens almost daily and sometimes more than that because of accidents around that intersection and now they want to put in a traffic snarling business like that there??? Lord have mercy my earswill be ringing even worse then they do now!! Bad bad idea!!!! I have to think that someone in the City Community Development Department has it in for Albany. More new homes in N. Albany with no improvement to access both in N. Albany and access to downtown. Santiam and Waverly is not only busy, it is dangerous enough. Gentle Dental will long for the days when all they had to do was fight the tiny parking spaces and congested parking next to Petco. Yikes! We will become part of the traffic problem since we have a 35 foot long travel trailer and we use that intersection to get to the freeway. Yup.. horrible planning. I can vision it now. Guess we shall have to find another route. There doesn’t appear to be much parking for either business? Can’t image how that is going to work for them? Where will employees park?